President Petro Poroshenko on 28 September commented on the international outcry caused by the language article in the new Ukrainian law On Education. "In recent years, we cautiously but steady are filling the state status of the Ukrainian language with the actual content. I want to emphasize that this was one of my priorities during the presidential campaign. And it is now being implemented - very firmly and persistently," the president said speaking at Drahomanov Pedagogical University in Kyiv on the occasion of the forthcoming Day of Educational Worker. He recalled about the adopted law on quotas on the use of Ukrainian language on the radio and a similar law for television, which will soon come into force, as well as the law on language in the service sector, which is in the works. 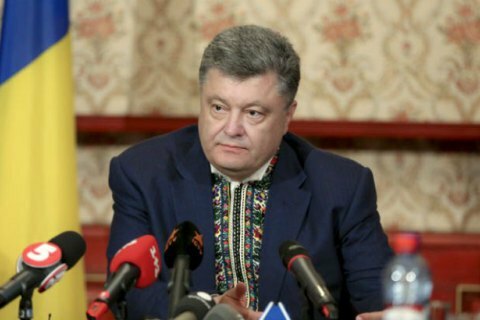 Poroshenko stressed the ongoing Ukrainization couldn't but impact the sphere of education. "There is nothing to discuss here. Every graduate of a Ukrainian school should be able to speak Ukrainian?" he said. "At the same time, as I sign one after the other laws that support our Ukrainian language, I pay and will pay close attention that wide space left to the free use of other languages that the citizens of Ukraine are using. Ukraine has demonstrated and will further demonstrate such an attitude to the rights of national minorities, which fully meets our international obligations, was in harmony with the European standards," he said. "Naturally, we will disregard the hysterical statements of the State Duma of the Russian Federation, which has long been dubbed a people's prison, from which we broke free... But we need to spare no efforts to explain our position to our European partners, first of all our neighbors. We should convince them and all the European institutions that the language article of the law On education fully meets the European practice," Poroshenko went on. "The new education law should in no way not alienate us from Europe, on the opposite it should bring us closer. I hear that the Ministry of Education has addressed the Council of Europe and Venice Commission. And I would very much like to ask our esteemed minister to actively defend our vision of mandatory guarantees of the rights of national minorities. The results of the review and this discussion, the results of negotiations with our European partners can be taken into account in the new version of the law on secondary education," Poroshenko said.